Safir Fintas Kuwait Hotel extends an invitation to lovers of diverse international cuisine to join in experiencing the “Flavors of Egypt,” replete with buffet, live cooking station, and live music, to take place at Flavors Restaurant every Thursday night from 7 pm to 11 pm. 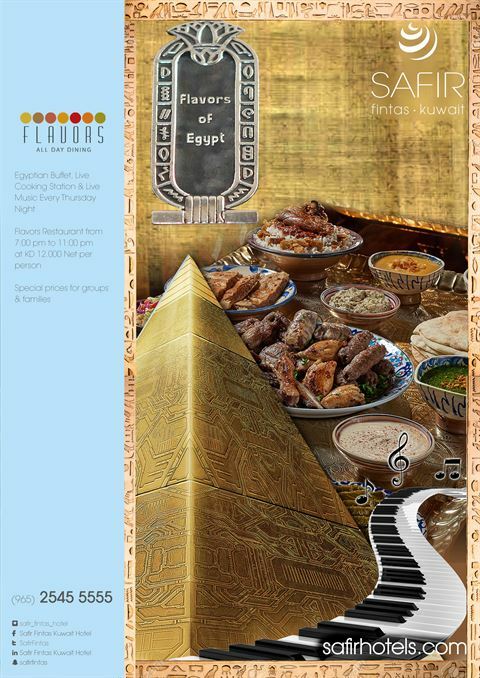 To make every Thursday a night to look forward to, Safir’s chefs have prepared authentic, traditional Egyptian dishes to satisfy all tastes, including an extravagant range of appetizers, mains, and desserts that utilize a rich assortment of colorful spices and fresh vegetables, legumes, and fruit. “Grilled Pigeon”: a delectable, mouthwatering dish that originated in Egypt. “Mahashi”: Eggplant, Cabbage and Baby Marrow stuffed with glistening, spiced Egyptian rice and boiled in a flavorful broth until tender. “Corchorus with Chicken”: a savory, comforting stew that consists of minced Corchorus leaves. “Hawawshi”: fresh, spiced minced lamb is encircled in dough and baked to aromatic perfection. “Kushari”: true comfort food, this dish is a delicious mixture of Egyptian rice, pasta and lentils. “Menbar”: lamb sausage stuffed with rice. “Beef Liver”: prepared and cooked in the Alexandrian style. “Om Ali”: Oriental bread pudding with raisons and almonds aside and “Rice Pudding” with mixed nuts are served among the dessert buffet. The warm atmosphere playfully reflects the history of Egypt and starts upon arrival at the entrance and continues into the interior of the restaurant. The décor, food and live music is designed entice your senses. 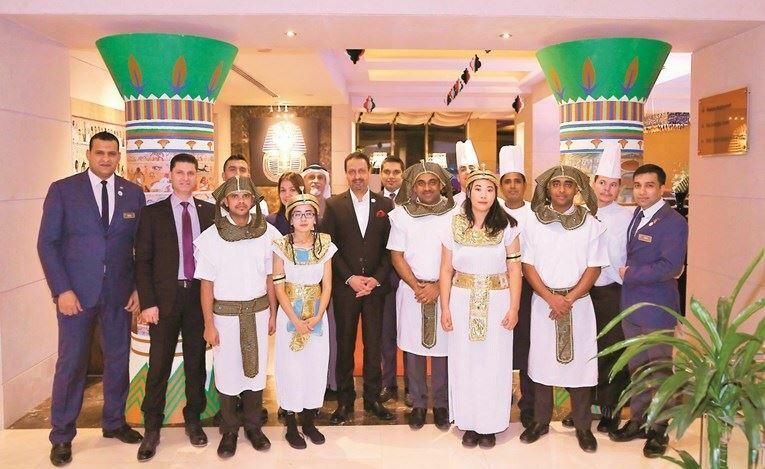 The “Flavors of Egypt” Egyptian theme night has been launched in the presence of the press and media and their families in recognition of their efforts and constructive cooperation as a permanent partner of the hotel, as well as to the friends and guests of Safir Fintas Kuwait Hotel who enjoyed the details of the Egyptian night and its unique ambience.